I love food and I hate food. We all have that internal list of “oh yes!” and “ewwwwww.” I’ve been spending more and more time in Scandinavia and they have a serious love of licorice there. I detest licorice. I’m also not a fan of fish, cooked carrots (raw are fine), and what is it with raisins in baked goods? I could go on about foods that I know I don’t like. Last time I was in Denmark, I decided to give licorice another chance. I haven’t had it in a long time and I opened my mind to delicious, yummy candy. Man, I still hate it. I managed to not spit it out of my mouth but I couldn’t control the facial contortions of torture. Way. Too. Intense. Now, that experience definitely confirmed for me that I simply don’t like licorice and since that hasn’t changed at all in 38 years, I’m going to go with the conclusion that I really just hate it (and maybe it just really hates me). As I pondered the fact that there are simply some foods that individuals love or hate, at some sort of physical, “OMG it’s poison” level, I also flipped through the foods that I used to hate, or thought I hated, and which I’ve changed my mind about. Zucchini is a big one there. As a kid I could not stand zucchini. We had it growing wild in our backyard garden and I had to eat a lot of it. Anyone who who grew up with zucchini in the garden knows what I mean. A LOT. I avoided it like the plague for a good part of my life and then somehow it managed to slip into my food as part of other dishes and one time I recognized it sitting there on the plate. Damn. I actually liked the stuff. Hrmph. I think a lot of my likes and dislikes, in all aspects of my life, are not like licorice, but rather like zucchini. We humans spend a lot of time defining who we are. Random associations, history, outside influences, determine a lot of not just our world view, but also our inner view. After confirming my hatred for licorice, I decided to open myself up to other foods and see what was really going on for me. I’ve started off by exploring the class of foods that I associate with licorice and have therefor been banned outright, without trial. 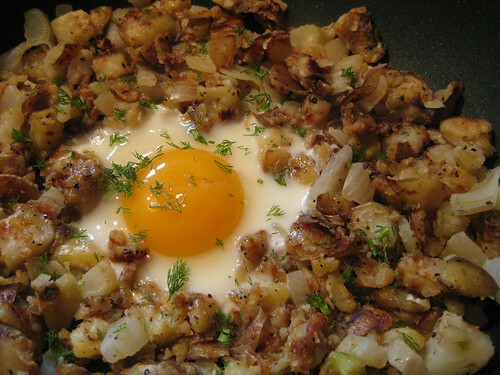 Today I made a Fennel Potato Hash that was just awesomely delicious. I’ve never (knowingly) eaten fennel before. As I was chopping it up and that licorice-like aroma wafted up, I almost turned back. After a little chat with myself, I kept going. “Open mind, open mind, open mind. Yum, yum, yum. People I know and respect love this stuff, so it can’t be inherently evil.” I persisted on and I’m damned happy I did, because it turns out I do like fennel. Well at least I do when it is cooked and mixed with potatoes. Trying it raw (where the flavor is a bit stronger) is something I’ll get around to down the road. And I’m sure I will at some point since the whole idea of figuring out what I really like, and want, is something worth pursuing. The dusty stories in my head shouldn’t override the experiences in front of me. So here is to living life and experiencing things as they are instead of how I think they are.